Every FarmHer has her secrets… How does one drive the grain cart all day and deliver a hot meal to the field that evening? For Bridget Arthur of North Iowa, preparing in advance is key. A typical day during fall harvest means Bridget drives their two older children to school every morning. Once her youngest son is settled in with an amazing in-home daycare provider, Bridget heads to the field. One of ​Bridget’s brothers-in-law takes the wheel when she needs to get her kids from school. Other times friends and family members transport the children to after school activities. Once harvest is finished, it’s time for Bridget to catch up with the farm’s bookwork and spend some time in the barn. Working with animals is something Bridget has enjoyed since she was a child, spending time on her grandparents’ farm and participating in Floyd County 4-H with a horse project. It wasn’t until she was married, however, that she found out how much she enjoyed field work. Bridget began dating Eric Arthur when she was a junior and he was a senior at Nora Springs High School. Upon graduation, Eric started working at Cartersville Elevator where he remained for six years. Eric started farming part-time in 2002 and left the elevator in 2005 to farm full time. Bridget completed an associate’s degree in business at North Iowa Area Community College (NIACC), and then she worked full-time at Principal Financial Group. 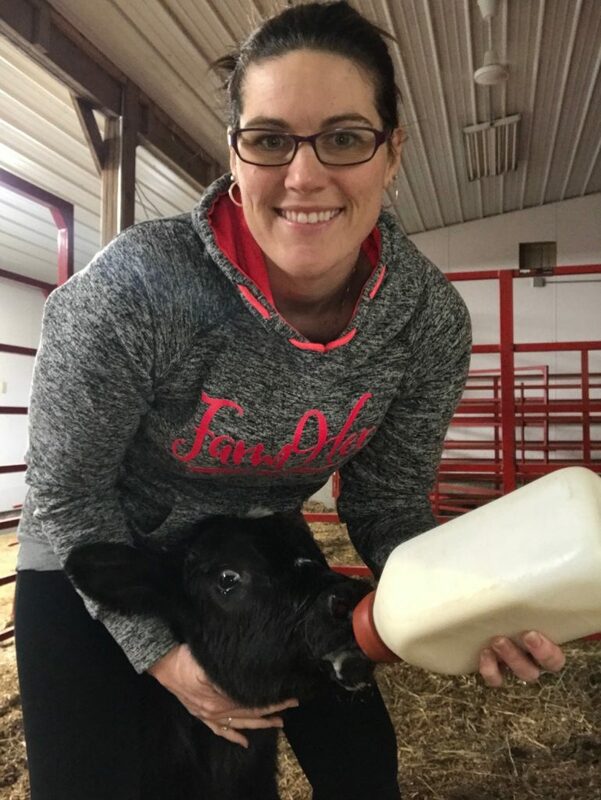 Although that company has won many awards for its flexibility and support of working mothers, Bridget longed to be a daily part of the family farm. The young couple was looking for a way to diversify their income, so they could both work full time on the farm. As the old saying goes, you never know where you’ll be when opportunity calls. Eric and Bridget were on standby for a flight to the East Coast when a friend called and asked if they’d like to invest in a purebred Simmental breeding stock heifer. 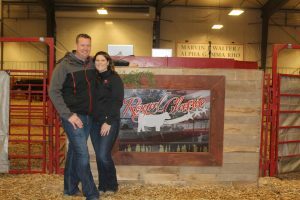 The Arthurs changed their flight from Boston to Denver and headed for the National Western Stock Sale and Show where they bought a heifer named Flicka. About 48 hours after they made the purchase, Flicka became the 2012 National Champion. At the time of their trip to Denver, Bridget was pregnant with their second child. 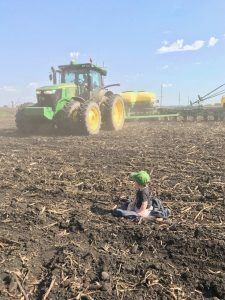 She and Eric made the decision for her to stop working off the farm after their daughter was born. Bridget began managing the farm’s financials and became more involved in the cattle operation. In addition to keeping health records and registrations up-to-date for their cattle, she also feeds bottle calves and halter breaks their open sale heifers. Eric is primarily responsible for the daily feeding of their 100 purebred Simmental and Angus cows. Eric and Bridget work together in their cattle operation year-round, whether they’re checking on cows during calving season, cleaning pens and putting down fresh bedding, or running cattle through the chute for vaccinations or breeding. They also move their cow-calf pairs to pasture in the spring and bring them home in the fall. “I have a passion for these cattle. 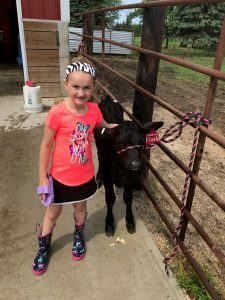 It’s rewarding to breed our cows, calve them out and then raise those calves to a become a two-year-old heifer, which we will then breed for our sale in Ames,” says Bridget. The first Saturday of January each year, the Arthurs and their partners sell about 80 head during The Royal Classic Sale. This live auction is held at the Hansen Learning Center in Ames, Iowa, and is simultaneously streaming online. To learn more about this upcoming cattle sale, visit www.ebarthurlandandcattle.com. Showing livestock is a family affair for the Arthur’s growing family. Their oldest son, eight-year-old Jaxon, got his first bucket calf when he was three and she’s still part of their herd. 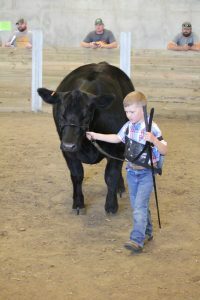 Last June, Jaxon showed a heifer at the Iowa Junior Simmental Field Day in Ames. 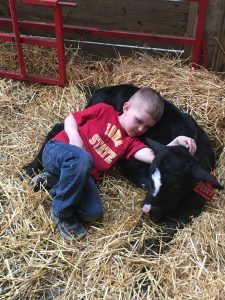 He also showed a bull calf at the 2018 Iowa State Fair. 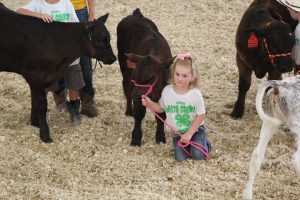 Jaxon and his six-year-old sister, Maci, exhibit bottle calves each year at the Worth and Cerro Gordo County fairs. Eric couldn’t be happier that his kids are taking an interest in livestock. He grew up raising calves and says the best weeks of his summer were attending shows. Partnering is key to growing both their cattle and crop enterprises. Eric and Bridget also farm with two of Eric’s brothers and his parents. The Arthurs share equipment and help plant and harvest each other’s ground. Each person packs his or her own lunch, and then at the end of the day, the person whose land is being farmed is responsible for providing a warm meal for the entire crew. Today Bridget is sharing with us one of her favorite harvest recipes for Crockpot Ranch Pork Chops. In a labeled gallon zip lock bag, combine pork chops, ranch seasoning and can of chicken soup and freeze. When ready to cook, can thaw overnight or dump into crockpot. Cook on low 6-8 hours (longer if put in frozen). Serve over mashed potatoes or with steamed broccoli.